Today on Green Car Reports: The 2014 Detroit Auto Show is upon us, and we’re bringing you all the details on the (few) greener vehicles from the show. The big news is a more efficient 2015 Ford F-150, plus the Audi Allroad Shooting Brake concept. All this and more on Green Car Reports. Tesla Motors will upgrade electric-car wall chargers for further fire protection. Electric-car market share in 2013: Here’s some more analysis to help you understand the numbers better. The 2014 Toyota Prius hybrid’s safety rating was lowered from five stars to four by a change in crash-test procedures. Unveiled at the 2014 Detroit Auto Show, the 2015 Ford F-150 features a lighter chassis, an all-aluminum cab and pickup body. and 2.7-liter EcoBoost V-6 engine option. 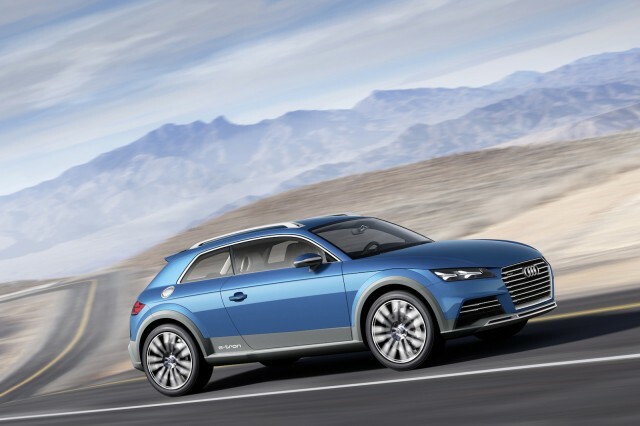 The Audi Allroad Shooting Brake concept is unveiled at the 2014 Detroit Auto Show. General Motors is recalling 2014 Chevrolet and GMC pickups over a cylinder-deactivation issue . A U.S. Bankruptcy Court judge orders the remains of Fisker Automotive to be auctioned off . Korea’s Ssangyong could come to America by 2016. The 2015 Audi A8 gets a refresh, and keeps its TDI diesel engine option.